Glamour doesn't have to be overstated. 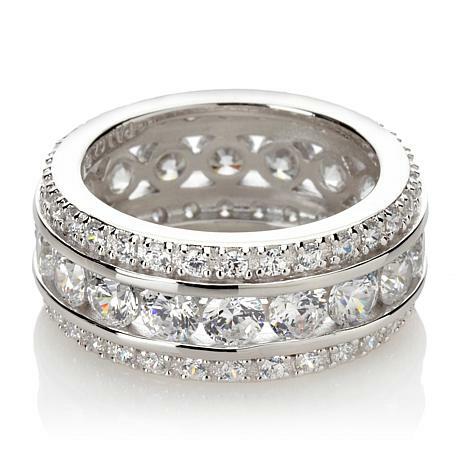 This ring is simply sophisticated, flaunting sparkle from all vantage points without being too flashy. The eternity design creates an uninterrupted style that's seamless and smooth—just like you! One of the most beautiful silver band rings I've gotten from absolute. It floored me!! I dove for the phone and bought the yellow gold as well!!! I get so many compliments some have offered me money for it! I refuse to be without these 2 GORGEOUS DAZZLING RINGS!! I WEAR THEM DAILY!!! GO FOR IT!! This ring is stunning. It's one of the most beautiful rings I own. Love it. I love the different stone shapes in the ring. Its top quality made and stunning to look at. Beautiful piece! 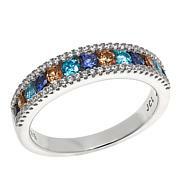 This ring...So pretty. Classy. 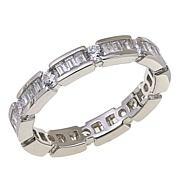 Just what I wanted in an eternity band. Very comfortable. 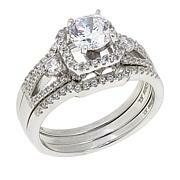 I will be wearing this daily with the Aurora solitaire. Nice job HSN. Like it a lot. Its a keeper. My all-time favorite CZ ring! 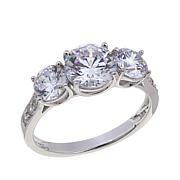 I started wearing CZ bridal sets 6-7 years ago and have worn several sets and styles. I've always chosen a design with a 2 carat center stone but decided to give this one a try. It has become my all-time favorite, due in large part to the fact that even the smaller stones on this style have a lot of sparkle compared to others purchased in the past. I'm on my second ring after the first one was lost on a trip, and I've never had a problem with stones falling out on this style.